Today I give you the last installment of the Pre-Wedding Week Series, it's been a fun time putting them together, because it made me look back at my own experiences and happy that I got to share them with you. Hope that some of the things I shared, helped you in some way or at the most entertained you. This installment is all about having fun and distressing. Most Brides and Grooms look forward to that night or in some cases weekend where you celebrate your "last day(s) of singlehood" or as some like to refer it as the "last day(s) of freedom." 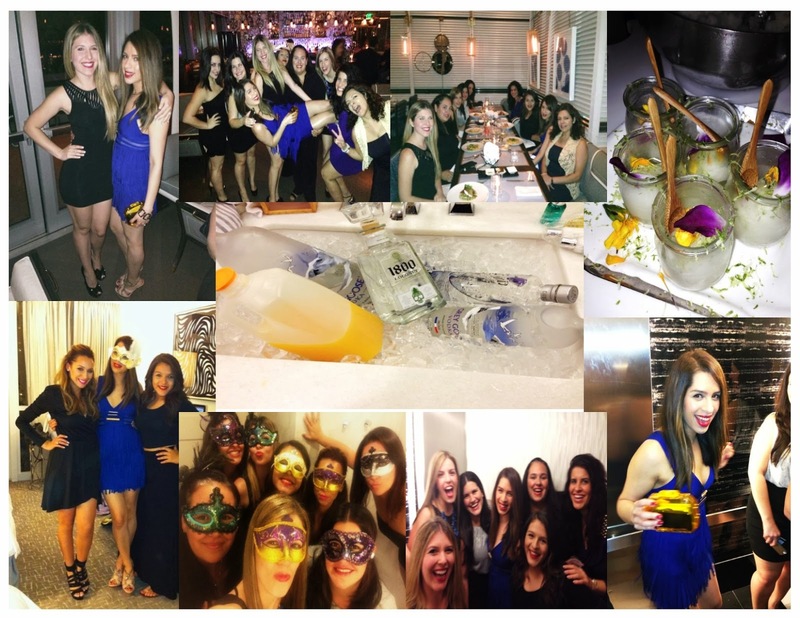 I was one of those brides that looked forward to it, although I always envisioned my bachelorette weekend as a trip to New York, but due to my move to Germany I decided that it would be to costly for myself and the rest of my bridesmaids so I kept it local and it turned out to be lots of fun. We stayed at the Fontainebleau Hotel in sunny Miami Beach, a place I know all to well and grew up spending my time in. 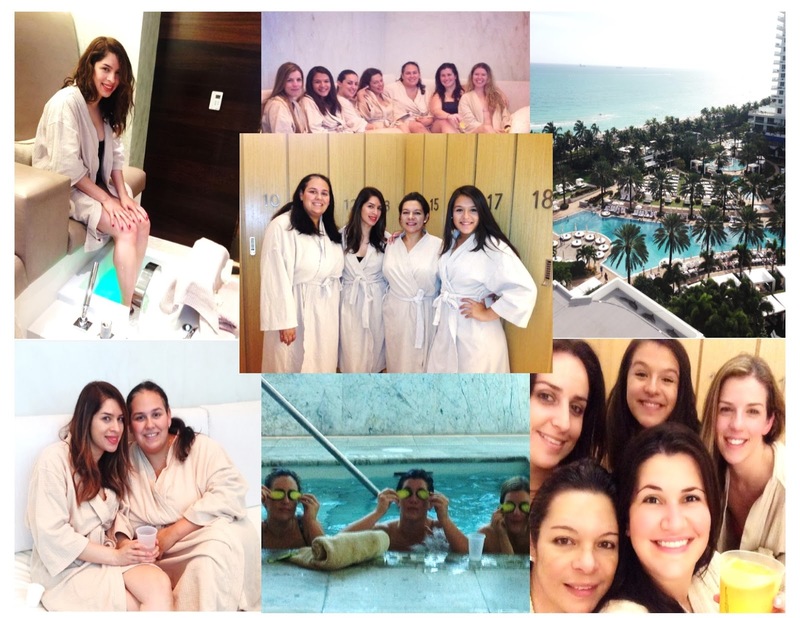 The Bachelorette festivities started on the weekend before my wedding, where we checked in on a Saturday and spent the majority of our time in the Lapis Spa. This will come as shocker for most of you (because every time I mention it, everyone goes array), it was my first time in a Spa, and the first time I got a full on spa treatment, I've done massages before but never at a spa, and oh so happy I did. I wanted to melt the whole day in there, I could have easily cancelled the rest of the plans but my MOHS and Bridesmaids worked so hard to put it together, it would have been a terrible thing to do, though I thought about it. The spa is incredible, the service and staff is superb, highly recommend. The festivities continued with an excellent dinner at one of their restaurants (as they have several, and pretty good ones), Scarpetta an Italian restaurant that has an intimate and romantic feel to it. Once we fueled up for the night, we hoped over to the SLS Hotel where we did a quick stop at their restaurant The Bazaar by Jose Andres where my bridesmaid Lily and her sister Lisi set up a very cool and chic Liquid Nitrogen Caipirinha tableside service. After that we walked right out on to the patio to Hyde Beach. That's where we ended our night, we thought we were going to go club hoping but half of the group was exhausted including myself, I really don't know how to party anymore. We headed back to the hotel for some girl chat until the wee hours, until each one of us gave into to our sleep, except one of my bridesmaid's who was very entertained and watched the sunrise.